The US space agency (Nasa) successfully launched its New Horizons mission to Pluto on Thursday. The probe lifted off at aboard an Atlas 5 rocket on a 10-year journey to the planet, some five billion kilometres (three billion miles) from Earth. The $700m probe will gather information on Pluto and its moons before - it is hoped - pressing on to explore other objects in the outer Solar System. Pluto is the only remaining planet that has never been visited by a spacecraft. The spacecraft was launched after being postponed for two consecutive days due to bad weather and technical difficulties. On Tuesday, controllers stood down the flight due to high winds at the Cape Canaveral Air Force Station pad in Florida. 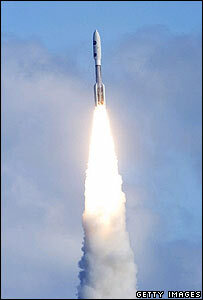 Then a power failure at the Maryland laboratory managing the mission forced that launch attempt to be halted. Sending up the probe before 3 February means it will be in position to swing by Jupiter on its way to Pluto. New Horizons will use Jupiter's gravity to pick up speed in a slingshot manoeuvre. This will increase the probe's speed away from the Sun by nearly 4km/s (9,000mph), allowing the spacecraft to reach the ninth planet by July 2015. If the launch had been pushed beyond the 3 February, the probe would have been required to take a direct route to Pluto, arriving in 2018 at the earliest. Some astronomers say Pluto is not a true planet at all, and should be classed instead alongside the small, icy objects which make up the region of space known as the Kuiper Belt. This region, which lies beyond Neptune, consists of perhaps tens of thousands of icy objects spread out between 30 and 50 times the distance between the Earth and the Sun. Pluto is thought by some to form a "double planet" with its companion Charon. New Horizons will fly by Pluto and Charon on the same day. The spacecraft's seven instruments will carry out detailed mapping of Pluto's surface features, composition and atmosphere. "The probe will map the composition of materials on the surface of Pluto [and Charon], which will help tell us what molecules were present during the formation of this system," Dr Stephen Lowry of Queen's University in Belfast, UK, told the BBC News website. 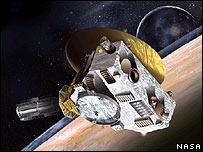 After the Pluto encounter, it is up to Nasa to decide whether to grant the spacecraft an extended mission. Should this happen, mission scientists plan to send New Horizons to visit two Kuiper Belt Objects (KBOs) with diameters of 50km (30 miles) or more. Scientists believe they can learn about the evolution of the Solar System by studying the Kuiper Belt since it possesses debris left over from its formation.